Classic Industries offers a wide selection of Cooling System Components for your Chevrolet Camaro. Classic Industries offers Chevrolet Camaro Gaskets & O-rings, Chevrolet Camaro Water Neck O-Ring, Chevrolet Camaro Water Outlet Gasket, Chevrolet Camaro Water Pump to Block Gasket, and Chevrolet Camaro Water Outlet Restrictors. Avoid water leaks which can compromise your cooling system. Re-seal your water neck with this replacement "O" ring. For use on various GM models. Replacement water pump to block gasket for early small block engines. Sold individually. 2 required per vehicle. Avoid water leaks which can compromise your cooling system. 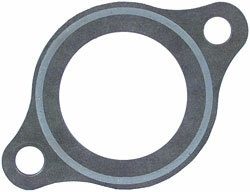 Re-seal your water neck with this replacement die-cut gasket. For use on various GM models.